When my son, Max, and I began work on our memoir, Walks on the Margins: A Story of Bipolar Illness, we knew we wanted to tell the story from each of our individual perspectives. He would write from the inside of his illness, showing readers just what it’s like to be manic, psychotic, and depressed. I would write from the outside, narrating my fear and my determination to find help. But of course, there was more to our story than points of view, much of which we figured out as we wrote. That was fine with me. As a writer, I’ve always felt that one needs to write to figure out what one really means and needs to say. I take comfort in E.M. Forster who asked, “How can I know what I think, until I see what I say?” And rewriting is in my bones. Max’s too. But having said that, we realized along the way that there were tools we could implement to make the process a bit less painful. Though this was Max’s first book, I’ve published four novels. I know what a story arc is, but I hadn’t thought to apply it as we worked on the memoir. After all, memoirs are non-fiction, a story of what happened, the story of one’s struggle. Why would we use the elements of fiction for non-fiction? I’m sure right now some of you are muttering under your breath, “Stupid Kathy, you should have known that!” Yeah, I should have. If I’d kept the story arc in mind when we started, we would have saved ourselves a lot of fumbling. Though it wouldn’t have made the story any easier to tell, we would have been focused a bit sooner, drafting a story arc early and reworking with each new draft. So my advice to anyone writing a memoir: Remember to consider the story arc. What is the story arc? It’s a beginning, a middle, and an end. 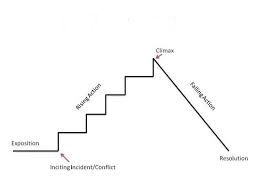 In his book Screenplay, Syd Field calls it the dramatic structure “a linear arrangement of related incidents, episodes, or events leading to a dramatic resolution.” When I write fiction, I eventually diagram the book on a long sheet of paper—a time line with each incident or plot point rising to the final climax and resolution. It becomes a visual road map and a way to identify places I’ve gone wrong. Once we’d written several drafts, Max and I realized we needed to do the same. We diagrammed our road map or story arc and began rewriting. From the beginning it was clear to us that our story started when Max had his first episode and was diagnosed with Bipolar I. However, our first drafts were narrations of one painful episode after another. Though each episode was different, the narration became wearing and numbing. It was too much. We realized we shouldn’t be including scenes just because they happened. So we cut, using only the episodes that moved the narration forward, revealing something new about our situation, the illness, about Max, about me. So much good material ended up on the cutting room floor. Most writers know how hard it is to ax what you consider perfect prose, a gripping scene, or an event you want to share, but if the narration didn’t add to the forward movement of the story, we took it out. Those scenes and bits of prose are tucked away in our computers. Perhaps one of them will someday make a great short story. Finding the right place to end was just as challenging. It was then that we again turned to the story arc, knowing that we needed to find a climax and resolution. So we cut the narration of Max’s last episode. (We know well that we can never really call an episode “last” anyway because bipolar doesn’t go away.) Instead we ended with the episode that was in many ways the worst—a culmination of all the other episodes and Max’s closest brush with death. The resolution followed in the final chapters, the summing of the years of crisis and fear, the coming to terms with the illness, the recognition that Max’s illness is forever, but that recovery is possible. In many ways, I think we approached the memoir the only way Max and I could. When we began, we were trying to make sense of the years of struggle and confusion. Writing everything out helped. We weren’t at all sure where we were going until we got there. We really didn’t know what we were trying to accomplish, what was ultimately important to us, until we’d been mired in the material for a couple of years. Yes, years. Only then did things start to take shape. Once we reached some solid ground, we wrote and rewrote, every draft tighter and more vivid than the last—eliminating clichés, generalizations, and abstraction, seeking the real words, the ones that drew a clear picture and told an honest story. We wanted those who read the book to put themselves in our shoes. We wanted them to understand what those with mental illness and their families go through. What is the story/situation? What is the life-changing event in your life? What are the specific events and obstacles. At some point, step back and evaluate, include what is important and meaningful to the story (not everything that is meaningful to you.) Each event should be included because it advances story. What is the turning point—final crisis? What is the ending event? What is the resolution? 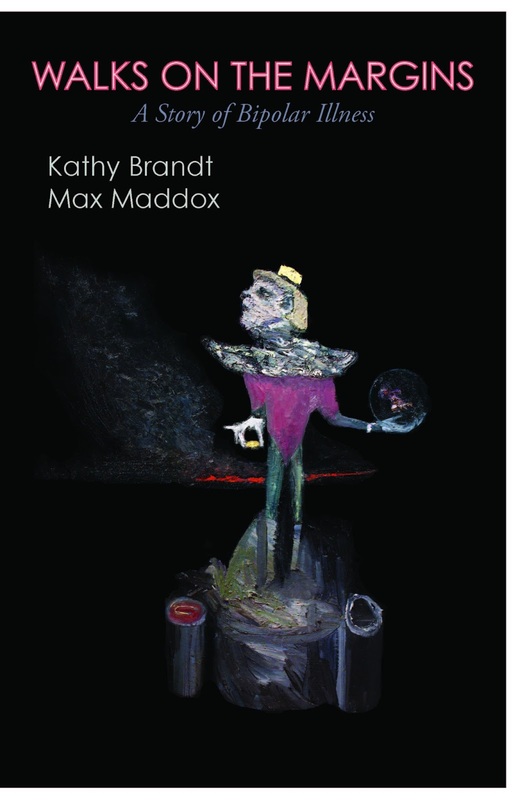 About the Author: Kathy Brandt is a published author who taught writing at the University of Colorado for ten years. After her son, Max, was diagnosed with bipolar disorder, she became active in mental health issues. She was on the Board of Directors of the National Alliance on Mental Illness in Colorado Springs (NAMI-CS) for six years, and served as President. In 2012 she received the NAMI National Award for her outstanding service to the organization. She is currently the NAMI-CS liaison to the Mental Health Court in Colorado Springs. Kathy has published four novels with the Penguin Group. She has a B.A. in English and an M.A. in Rhetoric. She lives in the mountains of Colorado. What great tips! I'm gonna keep this list handy for the next time I start a non-fiction story. Kathy-- these are indeed great tips and as Beverly said, I'm going to keep them in handy for my next nonfiction piece. I love writing nonfiction but making sure it reads like a story is tricky. Kathy: What a concise and excellent example of memoir writing. I'm curious, you mention drafts and you write about you and your son working together. Could you share how long it took you from beginning to end to have a book ready for publication. I'm in awe, specifically with the noted challenges you both faced. And a personal note. How is Max doing now? If you don't mind sharing. My thanks for sharing this important information. We started the book 5 years ago! A long and difficult process interrupted often by life events and episodes. Max is doing well. He and I are doing signings and speaking about the book. Our next signing, reading, and discussion is on Aug. 6 at the Tattered Cover, LoDo store from 6:30-8:30. I'm going to post it on the PPW list.